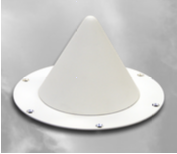 The AS-48915 Series S-Band antenna is a compact, low-weight aerospace qualified antenna in the conical og-spiral family. Designed to operate over the full frequency range of 1.7 to 2.3 GHz, the AS-48915 Series is ideal as an S-Band telemetry antenna and is available in either RHC or LHC polarization. This design was first utilized on the Solar Maximum Mission and the International Ultraviolet Explorer (IUE) for NASA Goddard. Customers have included Rockwell (classified platforms), Motorola, TRW (KOMPSAT andGeoLITE), and NASA Houston (International SpaceStation). By operating from 1.2 to 2.5 GHz with modified performance, the AS-48915 Series can also be used as a GPS antenna.